India’s one of the largest telecom operator Bharati Airtel is all set to shake the DTH world with its very own kind of revolutionary product. On 12th April 2017, Airtel has launched a new form of Set Top Box, which they call, the Airtel Internet TV. In addition to the core set top box features, it also has access to the Internet and will help customers get the most out of their Internet Connection. The product is itself revolutionary, having a lot of new features which were unseen previously at any other set top box. This set to box gives you access to 500+ Television channels including HD Channels which you get on a regular Airtel Set Top Box. The set top box comes with an 8GB of internal storage, which can further be increased up to 2TB by connecting to any Hard Disk or Pen Drive. Airtel recommends you have minimum 4Mbps internet connection to access the online content seamlessly. Else you may face buffering. 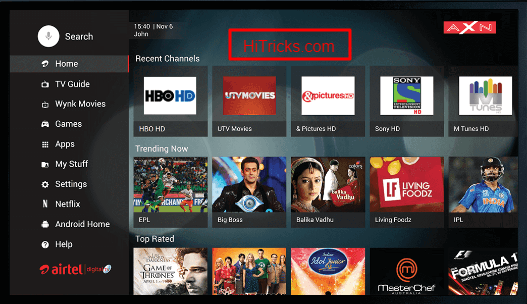 We had earlier seen Tata Sky, and other DTH providers included the option to stream videos from the internet, with their Video on Demand functionality. With this option, we had the opportunity to watch videos and music from their collection. But Airtel Internet TV brings the choice of the internet into our hands with its very own exciting features. One of the primary objectives of Airtel for launching this product is that they wanted their customers to take advantage of their television both online and offline. You can watch your regular TV channels via satellite and instantly switch yourself online to stream content from YouTube or Netflix or any other video streaming site. Airtel bridges the gap between your television and the internet and gives you a lot of possibilities to experiment with your existing television. The set-top box itself handles every feature; your TV does not need to have these functions inbuilt. Forget to buy the chromecast device to plug into your television. 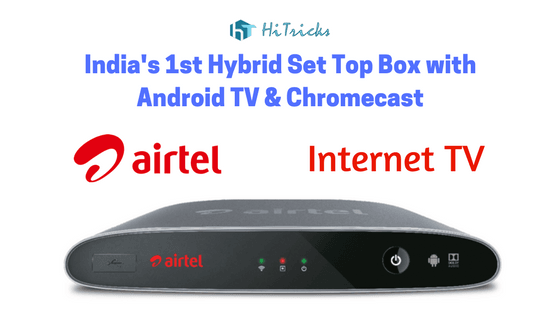 Airtel Internet TV Set Top Box offers the chromecast within it. 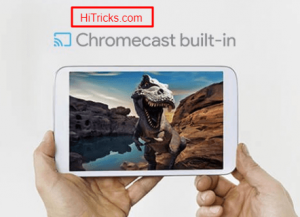 Chromecast is a device built by Google that allows you to mirror your Android to your TV screen, stream videos and pictures from your Android as well as your online storages into your television, play music and more. Once you set up your internet tv, it will connect with your Android device seamlessly and offer you the same features which chromecast offers. With the Airtel TV, you don’t always need to press buttons to access different places; you can just talk to it. Google Voice technology powers Airtel TV. It can hear you and recognise your instructions. So, the next time you need to watch a channel, you can only ask it to switch to that channel. Surprise! 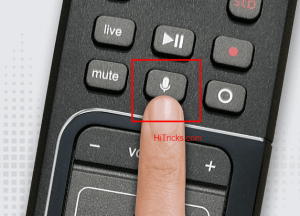 I liked this feature a lot, as it makes your remote much usable. Airtel Internet TV is powered by Android TV, giving you the access to Google Play and Airtel Games. You can play many of the available Android games on your Airtel TV. You can use your Mobile as a remote controller for the games you play using Gamepad Application. This can be useful for people who want a big screen experience for their games, but I like to play on mobile more. Controlling a game from mobile as a remote does not suit me so much. Well, the choice is yours. When it comes to watching videos, we all have access to the internet and we spend a lot of time watching videos from YouTube, Dailymotion, Vimeo, etc. These are possible to watch on Big Screen now with the Airtel Internet TV. It supports Netflix, the popular content provider for Movies and TV Shows. However, you need a Netflix subscription to access its content. Netflix subscription starts at Rs500 per month. Airtel Movies platform is also available from where you can get a lot of movies. Very soon, Airtel is going to bring other content streaming platforms like Amazon Prime Videos, Hotstar and Voot. Let’s see. Apart from the highlights stated above, there are a bunch of other features bundled with Airtel TV. It includes Wifi and Bluetooth to connect to your Wifi Router and Mobile Phone respectively. The better internet speed you have, the faster you can stream content from the web. 4K included with the Set Top Box. So, if you have a 4K Television, you can take advantage of watching 4K Content. Play, Pause and Record Live TV Channels. Download apps from Google Play, with the Android TV support. Currently, Airtel has introduced two plans for Internet TV. Both programs offer same features; the difference is in the validity. One is valid for three months; other is valid fo 12 months. You will get the entire array of Airtel services, including the TV Channels, Airtel Movies, Netflix, Youtube and Android TV for your subscription period. Airtel Internet TV: Where to Purchase? Airtel Internet TV is currently available in select pin codes of the following places: Hyderabad, Delhi NCR, Ahmadabad, Bangalore, Mumbai, Chandigarh, Ludhiana, Panchkula, Mohali, Jaipur, Pune, Chennai, Kolkata. Note that, if you purchase it, technicians from Airtel will help you connect it to your Television and set it up after the product gets delivered. You should not worry regarding that. Q: What are the minimum requirements for my Television to connect with Airtel Internet TV? A: Actually, nothing! 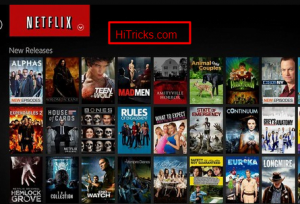 Airtel Internet TV can connect to any Television. But if you have an HD supported TV with a bigger screen, you can enjoy HD Channels and play games, etc. Remember all the features are handled by the set top box itself. Your TV is just showing the screen. Q: Can I discontinue using Airtel Internet TV after three months or 12 months? A: Absolutely. You pay for the months you use. Later you can unsubscribe. Q: Whom to contact in case anything goes wrong? A: The technicians from Airtel who will come to your house will give you service helpline numbers. Still, you can just reach out to Airtel Support anytime you want. Q: Do I need an active Internet Connection? A: Yes, you need an active internet connection to view online content. If you have a Wifi Connection in your home, the set-top box can connect to the wifi. If you don’t have an internet connection, it will only work with the offline features. That’s all about Airtel Internet TV, India’s first hybrid set-top box. 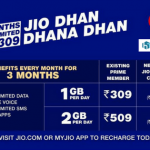 This time they launched something which will raise turbulence on the DTH field, somewhat similar to what Reliance Jio did on the telecom field. The only thing I am concerned about is the limited high-speed internet availability over the country. The minimum recommended speed to stream HD Content is 4Mbps, which may be tough for some people. Well, let’s see how it goes. If you have any further questions, please comment below. Do share this post with your friends and let them know about this fantastic service. Use the social share buttons.